- Summary of Findings tables now have proper footnotes, with numbering in the table. - Summary of recommendations and reference list is included in the Table of contents. - Adaptation text is included under the recommendations. 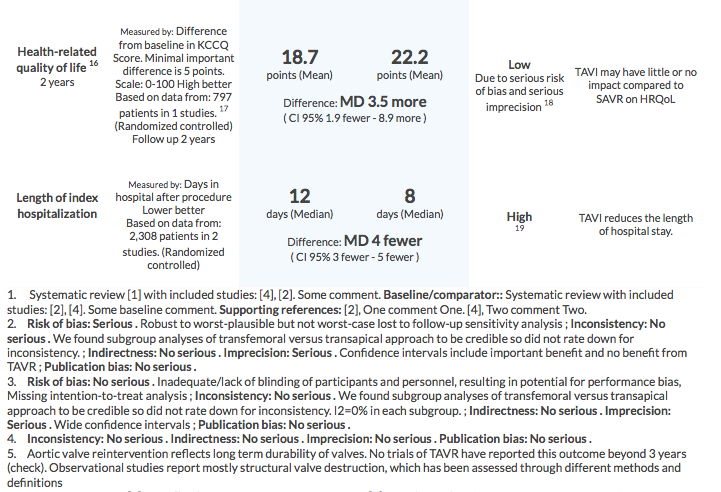 - Summary of Findings tables without outcomes will not show. For instances where your recommendation is not a GRADE'ed recommendation, but as a result of Law, or Statutory requirement. This will be lumped together with 'Information box' as Non-GRADE types in a submenu, so that it is clear to authors that these are not a GRADE recommendation types. The outcome forms have been tightened up to save space and make it less overwhelming. We have also tried to improve the visual guidance for the users through the input steps. 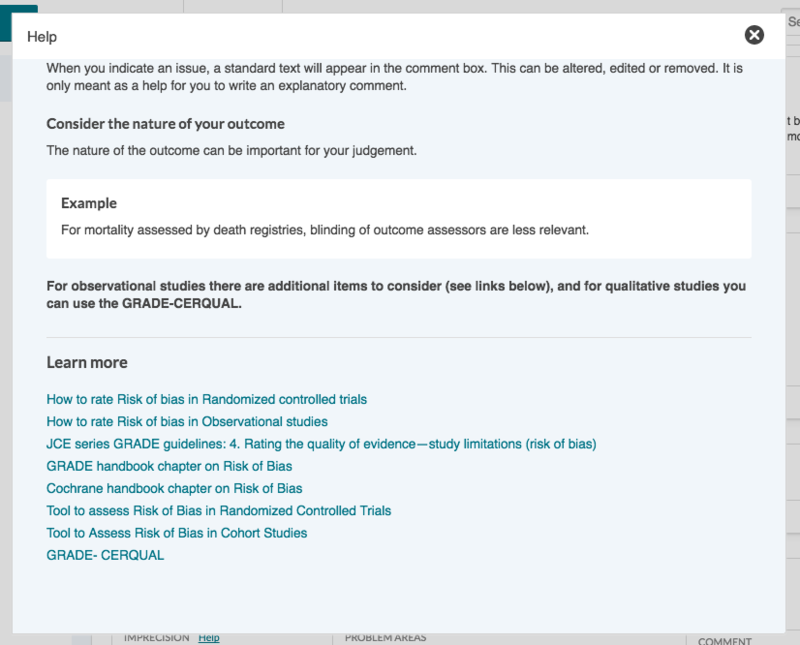 The GRADE help is now in pop-up dialogs, making it easier to read and see all the more extensive guidance links. 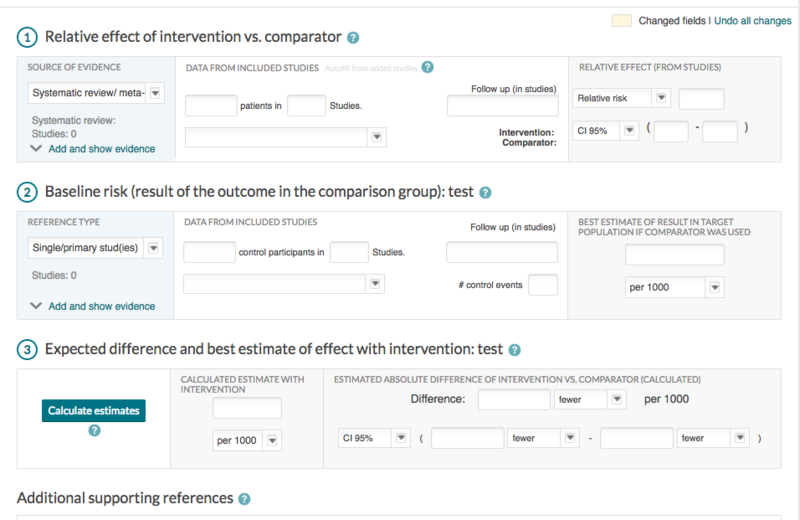 In the Evidence input for Dichotomous outcomes (image 1) and Continuous outcomes (Image 2) we have tried to make the input easier to understand, with a different colour for stating the Evidence source (blue), Data from studies (hvite) and Results and estimated effects (gray). To see more information or add the Source of evidence, you click the handle inside the blue box. 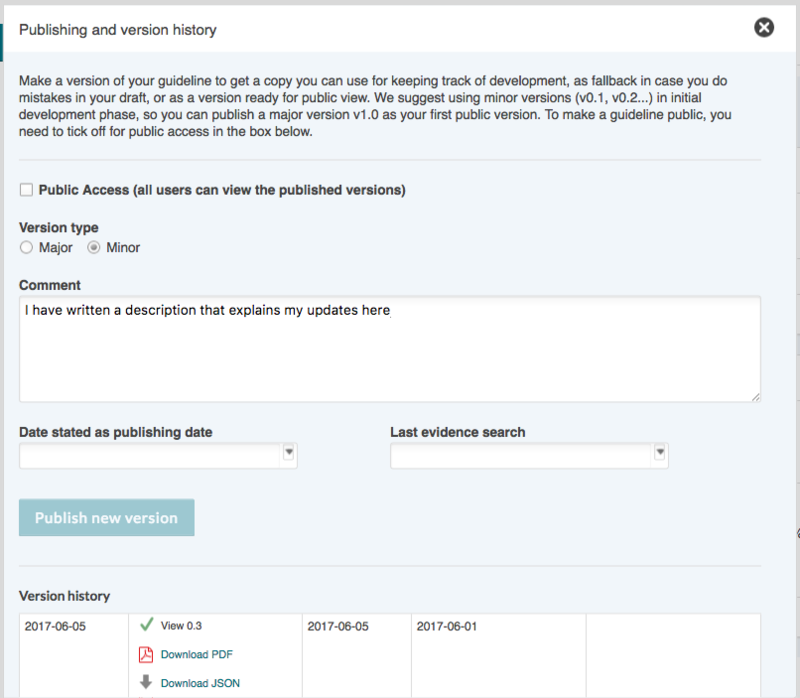 Outdated guidelines are marked with an "Outdated" label as before, but when users access guidelines that are outdated, we've added a pop-up alert letting them know, and linking them to the most current version. We added a possibility of not showing decision aids for specific PICO questions in those recommendations where showing it would not be appropriate or wanted. 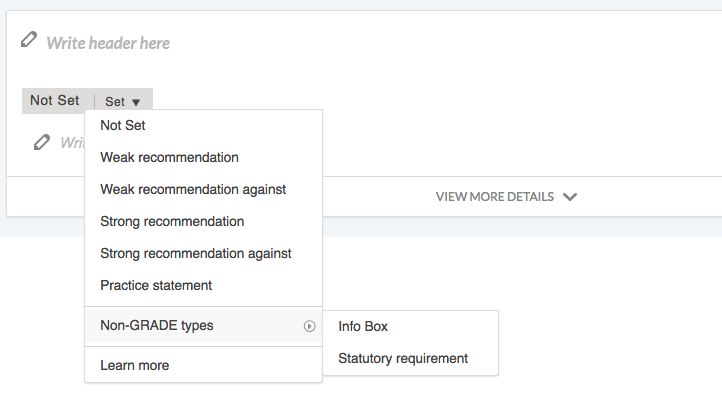 The choice is set in the Decision aid tab of each recommendation. 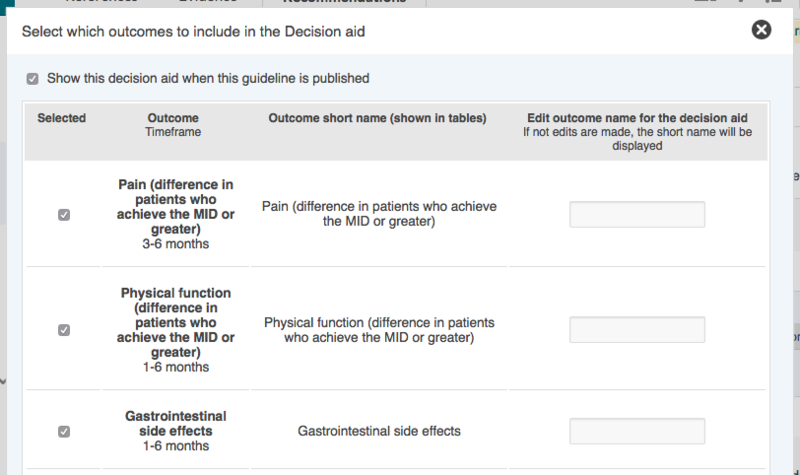 When you click the 'Edit outcomes' button on a Decision aid, you get a pop-up dialog where you can do edits for the Decision aid. 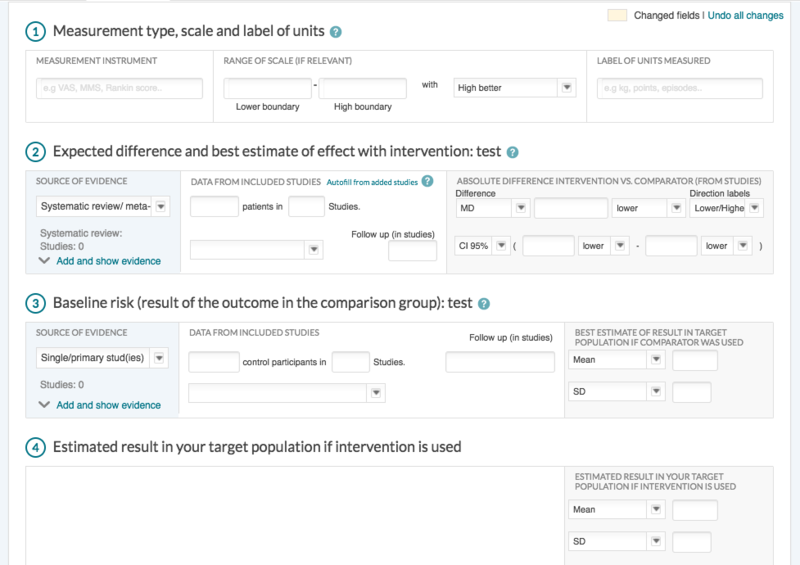 On the top there is a control you can use to choose to show (or not) the Decision aid to end users. The default setting is to show it. Currently we use the date the guideline is published as the publishing date showing on guidelines. In some cases however, there is a wish to use an alternate publishing date, e.g if you have transferred an old guideline to our platform. This will now be possible. Most of the time this month has gone into improving performance, and fixing smaller bugs and layout issues.